Muse and Passion Pit are playing Milwaukee's Bradley Center on October 6, 2010. Passion Pit came to Turner Hall this past April, and now they back up a major tour de force in Muse. This looks like (can't really tell,) the first time that Muse will play Milwaukee. Unless they hit a small, off the radar venue, I think I'm correct. Passion pit has one of those devoted, crazed, frothing at the mouth, fan bases. When Passion Pit and Muse play the together in Milwaukee, the combo might just be a perfect blend of fans. They may love each other, love to get sweaty, love to feel the pulse of a "brown note" coursing through their bodies. I am confident in the success of this pairing of fans because I work with a fan of both bands, and she was completely out of commission the day after the Passion Pit show. I say the words "Passion Pit," and she just smiles. The smile is to hide the fact that she's drawing a complete blank as to exactly what happened at the show she attended. It was that good. 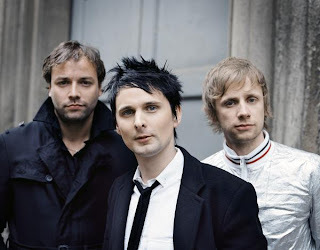 Muse has been around since 1994, and I had no idea of that fact. Muse and Passion Pit at the Bradley Center in Milwaukee will be a first time event for both bands. Okay, Muse has been around since 1999 and released five albums in that time. Yes, their first album came out five years into their rise to fame, and that explains my surprise when I read that the band started 16 years ago. And yes, their start was a bit of a spoof and flip off to the goth community during a "battle of the bands" contest that they actually won. Good thing that they won, because they trashed their gear at the end of that show. They quit their day jobs, changed the name from Rocket Baby Dolls, to Muse, and began to build that very important base of rabid fans. It didn't hurt to have Dennis Smith, a famous recording studio owner backing you up. Smith knew the parents of the Muse boys, and recorded their first disk. What will I want to hear when I go see this show? Assassin, off of Black Holes and Revelations is my hands down favorite tune. I challenged myself, and learned the drum lines note for note. The album didn't get the best of reviews, but none the less, I do like that song. I am so psyched for this show. Muse has visited Milwaukee once in 2006. I'm sure the second time around they will blow Milwaukee away.